A Gamestop informant leaks intel on the upcoming Call of Duty collector's editions. It's that time of the year again. The air cools, kids go back to school, and another Call of Duty game is set for release. A time-honored part of this tradition is the announcement of the special and extra-special editions. Activision reportedly leaked details about the upcoming Hardened and Prestige editions for Call of Duty: Black Ops 2 during a recent Gamestop Managers conference. 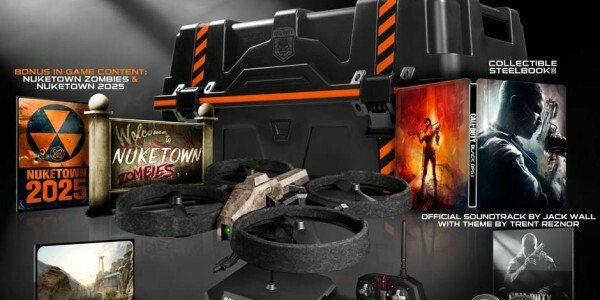 Players who shell-out for these limited-quantity editions can look forward to playing on exclusive maps, storing their game in a supply crate replica, and terrorizing their pets with a remote control UAV. Black Ops 2's Hardened Edition will release with exclusive weapon camo, player card backgrounds, maps, challenge coins, Xbox avatars, Playstation themes, as well as the expected artbook and soundtrack. The two exclusive maps are entitled "Nuketown 2025" and "Nuketown Zombies", apparently remakes of the original Black Ops classic map. The Prestige edition includes all of that and takes it a step further, coming packaged in a replica supply crate and including a remote controlled drone that hovers about on four rotors. While prices have yet to be released, previous Call of Duty Hardened and Prestige editions retailed last year for $80 and $150 respectively. The game releases on November 13th.